All modern cars equipped with electronic fuel injection systems use what is commonly referred to as ” torque management ” . When tuning the engine , this is mapped as a function of output torque ; is associated with each value of torque supplied by the motor a set of functional parameters of the engine itself , such as throttle opening , amount of fuel injected , advances, phases , etc. ..
All these parameters are managed electronically , variously combined, allow to realize all the torque that can be delivered , from minimum to maximum . The driver has at its disposal the accelerator pedal to apply the supply of a given torque , which will allow him to obtain the desired vehicle acceleration or maintaining a desired speed . For this reason, the injection control unit reads the position of the accelerator pedal (index of the will of the driver ) and , according to this delivers the corresponding torque , by suitably combining the values ​​of the parameters defined in the mapping . 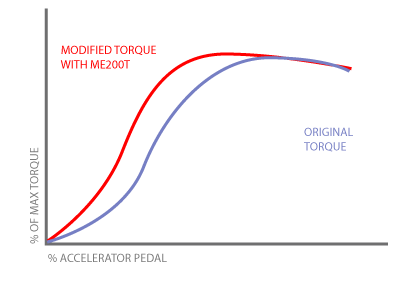 The correspondence between	the accelerator pedal position and torque is commonly called ” pedal law ” and is normally expressed as a percentage. If we now imagine , in the graph above , to reach the maximum torque with a pedal position of the 80 % , we would get that , with the same position of the accelerator pedal , the torque demand will be greater. This results in a greater feeling of readiness of the motor. The MM unit allows very accurate control of the original curve change management allowing to obtain a good drivability at low rpm (driving column or in the city , parking ) while ensuring maximum brightness you want. To be able to provide the pleasure of readiness related to laws pedal more suitable, without incurring the problems of drivability at low rpm ​​of pedal Magneti Marelli developed the pedal module.